This Demonstration illustrates the behavior of a system of two pure substances ( and ) and a solid compound of the two ( ). Solid-liquid equilibrium and solid-solid-liquid equilibrium are both represented in the phase diagram. Mixtures of pure solids are immiscible. The relative amounts of the four possible phases, given the temperature and mole fraction of (represented by the black point in the - - diagram), are shown in the bar graph to the right of the diagram. 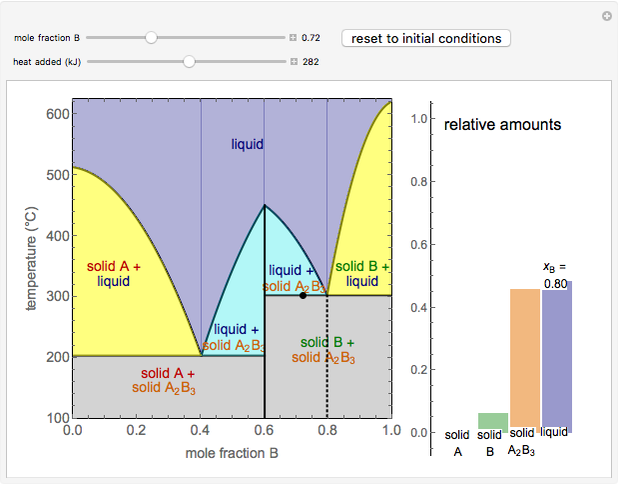 The mole fraction of in the liquid phase (mixture of liquid and liquid ) is given above the liquid bar in the bar graph. Since each solid phase is pure for the respective solid component, their mole fractions are omitted. You can move the black point by adjusting the mole fraction slider and the heat-added slider. When heat is added, the temperature will increase, except when the point is on one of the two horizontal lines, located at about 200 °C and 300 °C. On these lines, three phases can exist in equilibrium: solid and liquid, in addition to either solid or solid . A mole balance can be used to find the relative amounts of each phase on these lines. Before the temperature can increase or decrease, one phase must melt or one phase must freeze, respectively. The amount of heat added is meant to illustrate what phases can be present in this system, and how a given temperature and mole fraction of can result in multiple different phase distributions; it is not meant to represent an actual value for a real system. 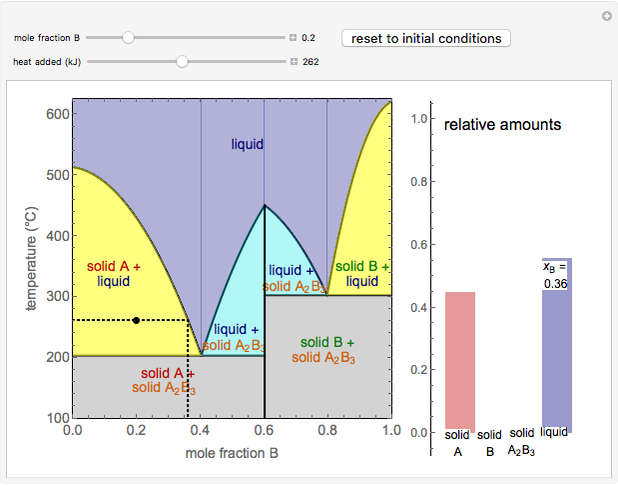 In the two phase regions, the relative amounts of each phase are given by the lever rule, and the mole fraction of in the liquid phase is shown by a vertical dashed line. 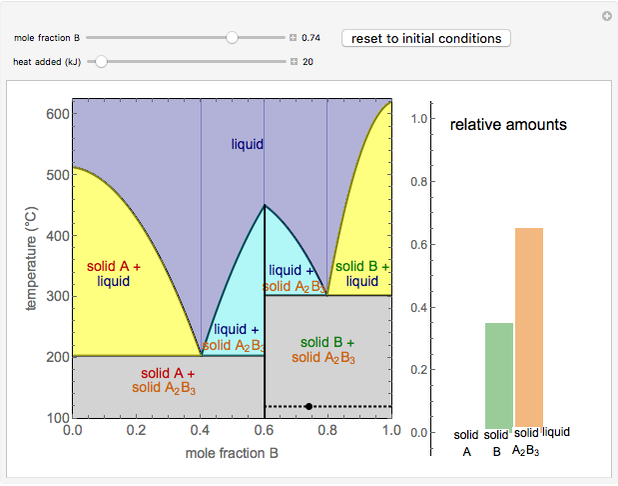 where is the overall mole fraction of the mixture (the mole fraction of the point in the - - diagram), is the mole fraction of in the liquid phase, the mole fraction of in the solid phase is zero, is the relative amount of liquid, and is the relative amount of solid . Megan E. Maguire "Solid-Solid-Liquid Equilibrium"